Move over blogging, podcasting is the new and cooler kid on the block. Finding data on the US, let alone Australian, trends and statistics when it comes to this medium was quite challenging. So here are 7 podcasting statistics that explain the rise and opportunity available to small business owners with podcasting. Due to the rise of smartphones since 2009 as well as the market for podcast apps in maturation with apps such as iTunes, Stitcher and Podbean easily accessible to listeners. In the same report C&C shared that in 2016, 64% of podcasts are being listened to on a smartphone or tablet. Just as it did with blogs over the past decade, mainstream media have started the leap into podcasts. Though actual content is still limited in terms of variety and topics, this is a positive sign for podcasting as a medium of communication and advertising. All of these shows are great examples of how podcasting can be a great marketing channel for growing a personal brand, influence and business online. With cost of production tools decreasing in recent years, the production of many podcasts is now equal in quality to radio. A good quality podcast episode can be recorded using a $150 microphone, within the budget of many business owners. If you’re curious as to which podcasting equipment to start with check out this list shared by Colin Gray The Podcast Host. It’s also worth noting that audioBoom (a spoken word audio-on-demand and podcast platform) has seen a 10% rise in growth year-on-year from within Australia. 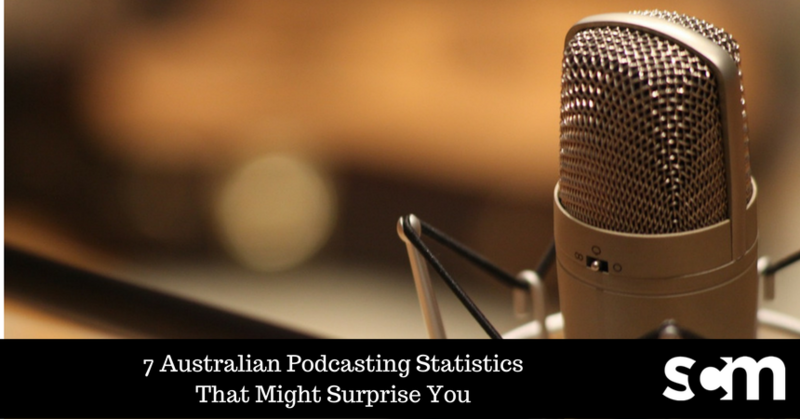 I asked my Australian podcast community, and fellow members of the 7 Day Startup Pro mastermind group, to share some of the stats for their podcast as well as business benefits they’ve seen as a result of podcasting. As Ronsley rightly pointed out, it’s not always about the numbers either. Podcasting can help business owners find and connect deeply with their tribe (and other podcasters), develop self confidence, land speaking gigs, and sell products and services. But I will say this… My engagement versus downloads is pretty f****** amazing. I literally had about 30 people pull me aside at Problogger (event) to tell me specific stories of how listening to my show has made them take action, or affected them in some out of this world, mind blowing way. And that has always been my focus. Those people are loyal as f*** to me. I’ve been about making people feel okay about where they are and know that they aren’t alone. And I’ve been the thing you are not supposed to be as a podcaster… Inconsistent! Since creating my podcast I’ve seen a definite shift in my business. It’s helped me built more of a following, more authority and, personally more confidence. In terms of specifics, my copywriting podcast generated around $10-20k in course and resource sales last year, and through being on other people’s podcasts I’ve landed speaking gigs. Podcasting helped my business so much, I’ve actually just launched a second one. Want to start or publish your own podcast? Want the above infographic sent to you as a PDF? Submit your info below and we’ll send it to you instantly. Prefer to have someone help you launch your podcast, or to put your existing podcast on autopilot? Check out our done-for-you podcasting service. Love it! Thanks so much for the shout Anfernee! Thanks Kelly! Loving what you’re all about!